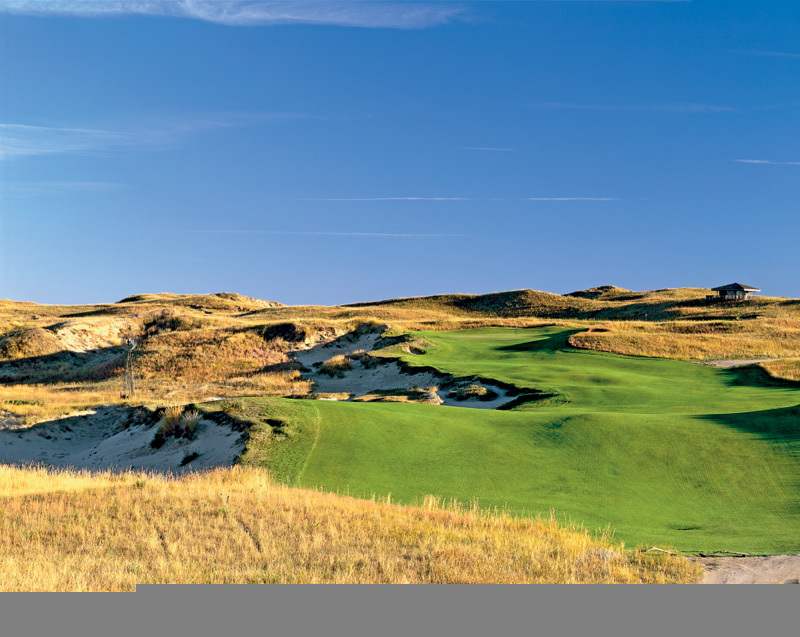 Arguably the most important American golf course since Augusta National, Sand Hills is set among the endless rolling dunes of north-central Nebraska. Its 1995 opening not only placed this remote and seemingly desolate region firmly on the golfing radar, it almost single-handedly lead to a rebirth in classic golf architecture in this country. 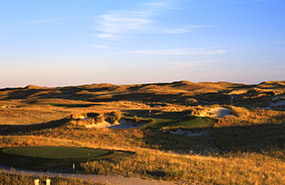 Set within an expansive valley and surrounded by some of the game’s most impressive dune structures, the course was created by Bill Coore and Ben Crenshaw who spent more than two years investigating possible ways to route their holes across this incredible landscape. Prior to selecting their final arrangement more than 130 quality holes had been identified, the pair’s toughest job being to work out which ones needed to be sacrificed for the sake of routing coherency. Aside from displaying unprecedented levels of variety and excitement, their selected holes were also simple and inexpensive to build, with soft shaping of some greens and tees but very little earth moved during construction. The result is one of the most natural layouts in golf, the tee and green locations “discovered” by the designers and the fairways simply draped majestically across Mother Nature’s undulations. 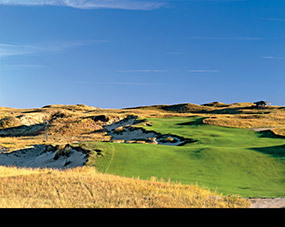 Although winds can whip through these Nebraska plains with great force, they don’t come from a prevailing direction so the designers were careful to ensure their holes were playable under all conditions. Fairways are sensibly spacious, while the target areas are mostly open to encourage chase-in approach shots. The diversity of the putting slopes is impressive, as is the variety of the actual green locales, whether they be pitched in hollows, set atop plateaus or built beside exposed sand dunes that have either been tidied into formal traps or left in their raw state. Dominated by huge sandy blowouts, the 1st and 18th holes were apparently the first that Coore and Crenshaw discovered here, and much of the routing revolved around their retention. Sweeping through a series of rugged bunker shapes toward a small platform green nestled within a natural amphitheatre, the par five opening hole is one of the best in the world. The 18th is even better and much of what’s between is just as good. While some holes do standout for special mention, exquisite green contours at the 2nd and 3rd, lumpy ground undulations on the 9th, strategically placed fairway bunkers on the 5th and 10th and a cool skyline target at the 11th prevent any of the others from suffering by comparison. More obvious glamour holes include the par four 4th, which tumbles almost 500 yards toward a sublime green perched on a shelf, a monster 30-foot crater guarding one side of the putting surface and a sharp fall-off protecting the other. Shorter but no less sinister, the 7th is reachable in the right winds but its green rests dangerously atop a tightly bunkered knob and is more difficult to hold the closer you play your pitch. The 8th is another solid shortish par four, its clever horseshoe green wrapped around a nasty central bunker. On the back nine, the two-shot 12th is an excellent test, its bulging fairway split by a vertical ridge that kicks inaccurate drives down into sunken hollows. The par three 13th, which heads into a green saddled atop a distant dune, and strategic bunkering on the uphill 15th, where golfers who can attack the right-hand bunker are given an optimum line into a crowned target guarded by another fearsome trap, are both very good. The finish is also first-class. Following a gorgeous falling five at the 16th, which continually rewards those able to hit their first two shots close to sand, comes an impossibly beautiful short par three with a postage stamp-sized green surrounded by deep shaggy bunkers. The 18th is then a magnificent uphill closer, its fairway running right-to-left across the tee and set immediately beyond an enormous sandy blowout. To reach the final green in regulation, the climbing approach has to negotiate a continuum of this hazard as well as a sharp false front. 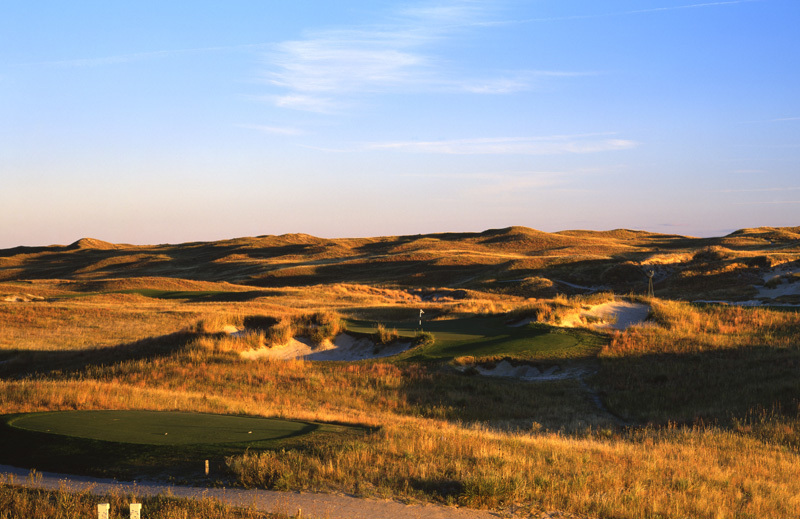 Despite the success of Sand Hills, Bill Coore and Ben Crenshaw have resisted the temptation to stretch themselves beyond one or two new projects a year. As a result the pair are able to put more time and effort into each golf course. Not surprisingly, their portfolio of completed courses is the envy of every other golf architect in the business today. Although they have had more dramatic and more beautiful pieces of property since the Sand Hills, somehow this landmark creation has remained their signature piece. Like so many great courses in America, the only disappointment with the club is that so few passionate golf people actually get to play here.